With the 2018 SHOT Show underway, here are a few new turkey hunting items from Las Vegas that have caught the attention of OSG writer Lynn Burkhead. With SHOT Show 2018 underway in Las Vegas, spring turkey hunters have a number of new gobbler getting items to consider in 2018. A number of years ago, some savvy spring turkey hunters utilized taxidermist stuffed birds to gain an extra edge in realism to aid in the process of luring a trophy gobbler into shotgun range. Today, the same effect can be had with the current generation of collapsible turkey decoys like the brand new Avian-X Trophy Tom. This new ultra-realistic 2-D Avian-X decoy is far more cost effective than a taxidermy specimen, not to mention far more durable. With a collapsible stake and a carry handle, the intricate details molded into a superb paint scheme allow the Trophy Tom's one-piece design to do double duty in displaying a dried tail-fan and beard at home as well as working a lovesick longbeard into scattergun range on a spring day. And all in a package that isn't much larger than a a large framed art print. Able to beautifully display a trophy gobbler's fan and beard on the wall at a fraction of the cost and space necessary for a regular mount, the Trophy Tom from Avian-X will work in any home or office setting. When taken into the spring woods to be used as either a strutting 2-D decoy or the key to stalking and "fanning" a gobbler into range (on hunting ground where it is safe to do so), the versatile new offering from Fred Zink's decoy shop is a practical piece of hunting gear that solves multiple problems at a very reasonable cost. 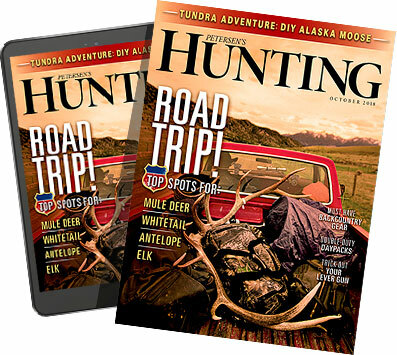 Always on the search for the perfect spring turkey vest that strikes a balance between a rugged lightweight design and plenty of storage space for turkey calls and other necessary hunting gear, the new lightweight Tenzing TZ TV18 turkey vest appears to fit the bill. Constructed in similar fashion to the company's highly regarded fall whitetail and big game hunting packs, the TZ TV18 has fully adjustable pack-style shoulder straps, a high-performance air-mesh back panel, and a fold-down dual-layer foam seat. With the seat cushion deploying and stowing away quickly thanks to integral straps and HDPE quick-release hardware, the 2,500-cubic inch vest has plenty of specialized gear pockets including dedicated space for box calls, pot style friction calls, strikers, diaphragm calls, shotshells and more. There's also ample room for accessory items like collapsible decoys, snacks, cameras and water bottles. Adding in a quick access phone pocket along with a pair of perfectly positioned handwarmer pockets for chilly early spring mornings, the Tenzing TZ TV18 vest is available in the tried-and-true Mossy Oak Obsession camo and the new Realtree Edge camouflage pattern. Long a leader in the building of stylish clothes that can take a beating outside, Carhartt made a splash at SHOT Show 2018 by entering a much talked about partnership with Toxey Haas' Mossy Oak Camo company. One Carhartt item that turkey hunters will take note of is the company's mid-weight hooded sweatshirt constructed of 10.5-ounces of a 50/50 blend of cotton and polyester. With a drawstring hood, front hand warmer pockets, spandex reinforced cuffs and waistband, and the stylish Carhartt logo (on the sleeve in safety enhancing orange), this Mossy Oak Break-Up Country sweatshirt is perfect around turkey camp, in the early spring woods, or in doing after hunt chores on the back-40. A longtime leader in the hunting accessory market, TRUGLO has unveiled its new Head-Banger Long Range Turkey Choke at SHOT Show 2018. With Multi-Phase Groove Technology, a shotgun load's wadding is engaged on the shot, streamlining the pellets into a tight, consistent pattern that produced an average of 305 pellet hits in a 10-inch circle at 40-yard distances during testing. Rated for Hevi-Shot, Federal Premium 3rd Degree, Winchester Long Beard XR, and other high-performance turkey loads, this CNC-machined choke tube is heat treated for durability and polished for better seating and sealing at the choke tube's end near the screw-lock threads. The result is wicked downrange patterning that will help to put a big gobbler on the dinner table. Utilizing Tungsten Super Shot Pellets, the new Heavyweight TSS turkey load from Federal Premium is a devastating shotshell that brings high-end performance to the springtime woods. With the load's FLITECONTROL FLEX wad, the Heavyweight TSS load is extremely dense, even at longer ranges, producing a swarm of high-energy hits that will tag a trophy spring gobbler. How dense? Federal Premium testing found that the shotshell produces a payload that is 56% denser than lead and 20% denser than the company's original HEAVYWEIGHT tungsten load. Available in 12 and 20-gauge sizes, the HEAVYWEIGHT TSS shotshell is also available in .410 shotgun loads. Built on the performance legacy of the Winchester Ammunition company's previous Xtended Range turkey loads, this year's Bismuth version utilizes ShotLok Technology and Bismuth to give longbeard hunters a high-performance load to use in places where lead shot isn't permitted. Thanks to a density that is greater than steel, bismuth brings superb penetration right off the bat. Add in Winchester's ShotLok Technology and the result is a shot load that doesn't fracture, hits downrange with a dense pattern, and delivers great lethal energy to the long-bearded target. Named thanks to his relationship with a renowned late Mississippi turkey hunter named Charles Whittington, Primos head man Will Primos says that the company's new Tall Timber Gabriel Box Call is his number one go-to box call. Hand built for years, the Tall Timber Gabriel is now available to the nation's turkey hunters through Primos' well-known call making shop. Utilizing a hardwood box and an engraved Purple Heart paddle, the sweet sounds that this new box call produces are more than enough to lure in an "Old Gabriel" tom. And when a hunter's yelps, clucks, cuts, and purrs produce the sweet woodsy music necessary to bring that old gobbler into range, somewhere in the vastness of eternity, Mr. Whittington is surely smiling big. Few things in the woods get an old Louisiana swamp gobbler â€” or any wild turkey in any state for that matter â€” more fired up than the sounds of a wise old hoot owl. Capitalizing on that natural response, the new Strut Commander Hootie Locator Call uses the hooting sounds of a Great Barred Owl to produce realistic music designed to trip the trigger of an edgy old longbeard in a shock-gobble response that will tell you exactly where he is. Then all that's left to do is to call him into shooting range, pull the trigger, and put the gobbler in the oven with Miss Kay Robertson's favorite turkey recipe somewhere nearby! Crafted for hunters who need a smaller mouth call to lure a lovesick longbeard into shotgun range, the new undersized Lil' Double and Lil' V diaphragm calls from Flextone bring big gobbler getting sounds in a smaller package. Featuring the same traditional cuts and reed configurations found in full-frame Flextone mouth calls, the more streamlined profile and compact design makes the Lil' Double and the Lil' V easier to blow. That makes these calls perfect for women, youth, or any turkey hunter who has a smaller palate.